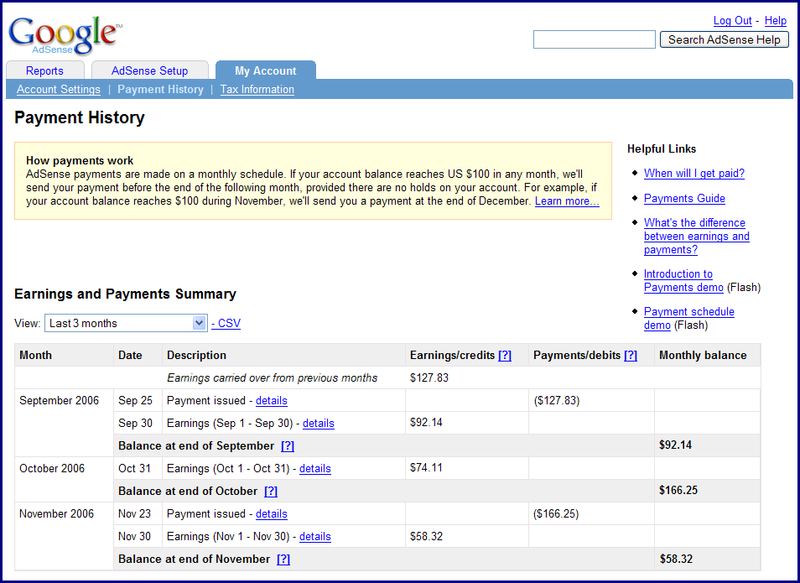 You'll now find your earnings and payments divided into two separate columns so you can better distinguish between them. 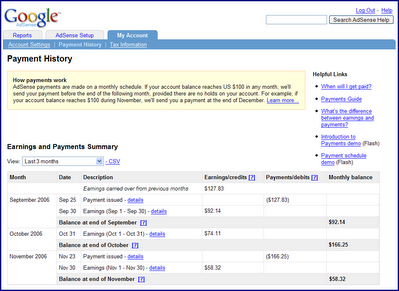 Clicking on any details link will give you more information about the noted Earnings or Payment event. For example, the details link associated with a payment will show you the payment number, amount, date, and depending on your form of payment, the tracking number. We've also added a Monthly balance column, which displays the running total of your unpaid earnings and credits at the end of each month. If this column shows an amount greater than $100 and you've removed all holds from your account, you'll be issued a payment at the end of the following month. You can see an example in the screenshot above -- since the publisher's unpaid earnings totaled $58.23 at the end of November, a payment will not be issued during December. Have questions about our payment process and schedule? The Payments Guide is the place to find answers. If you've glanced at your Payment History page today, you might've noticed that it's been revamped with a whole new look. Don't worry -- all of your previous payment data is still available and our payment process hasn't changed. We've simply updated the layout to make it easier to keep track of the financial activity in your account, and most importantly, help you determine when you can expect your next payment.